This is Jack and we got him from a rescue center when he was 1 year and 9 months old. He had had five homes in this time. Why, we don't know. 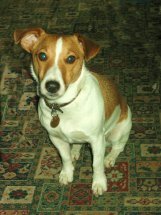 He was a frightened doggy when we first had him, but with a lot of love and affection he has regained his confidence. He still barks at strangers but we believe with patience we can overcome this problem. His basic training is very good, but has to be reminded who is the "Top dog". He never lets me out of his sight on walks to the local woods. Now he is knows where his home for life is and it is a joy to see him play with his toys. He sleeps on our bed but always with a look, he asks if he is allowed to. He knows when it's walkies time and comes and sits in front of me with a look that only means one thing. "It's time"
He hates cats, so now none come to our garden to catch birds on the bird table. Squirrels come to our garden so he sees them off but sometimes they sit out of reach and peer down at him. He is a wonderful loving companion and such a pity he had such a bad start in life. When he is not on his bed, he snuggles up to me on the sofa. A dog is for life and not just for Christmas. We humans are so blessed to have such companions.A friend for life. What a lovely story ! Your comment at the end is the sign I have in the back of my car. Five homes in a year is awful! No wonder he was a frightened little boy. I am so glad that he has found his forever home with you. He sounds like a lovely little boy. Well done you!